The Network provided strategic communication support for a three-year project in the Bahamas to improve management of existing marine protected areas (MPAs) and expand MPAs to restore local fisheries. At the request of key project partners, Bahamas Reef Environment Educational Foundation, The Nature Conservancy Bahamas, and the Bahamas National Trust, Network staff led a one-hour strategic communication webinar followed by a two-day training six months later. The trainings built participants’ strategic communication and facilitation skills, and helped them refine key messages to conduct targeted and coordinated outreach across the Bahamas archipelago. 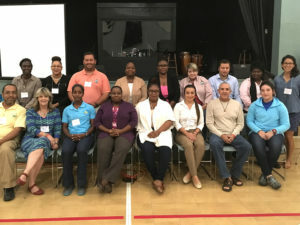 Thirty-five Bahamian outreach specialists participated in the online and in-person workshops. Facilitation training was provided by NOAA.